provisionally allowed to appear may look for their Names and Roll Number along with Examination Centre at office of the District Agricultural Officer of their respective district on or after 1st September, 2015. The candidates are requested to download their provisional admit from the website www.cld.aau.ac.in or www.aau.ac.in or www.rkvyassam.in in 10 (ten) days prior to the examination. The candidates must bring Two recent Passport size photographs and valid Identity Proof (Identity Card/ PAN Card/ Voter Identity/ Driving License? Bank Passbook/ Passport /Educational Admit Card). No candidate will be allowed to enter in the Examination Hall after 15 (Fifteen) minutes of commencement of the Test. The reporting time at the Examination Centre will be 01 (one) hour before the commencement of the test. The written test will start from 11.00 and closed at 12.00 hours. No Mobile Phone/ Calculator/ Bags or any other Electronic Gadgets will be allowed inside the examination hall. They should maintain silence and discipline in the examination centre. 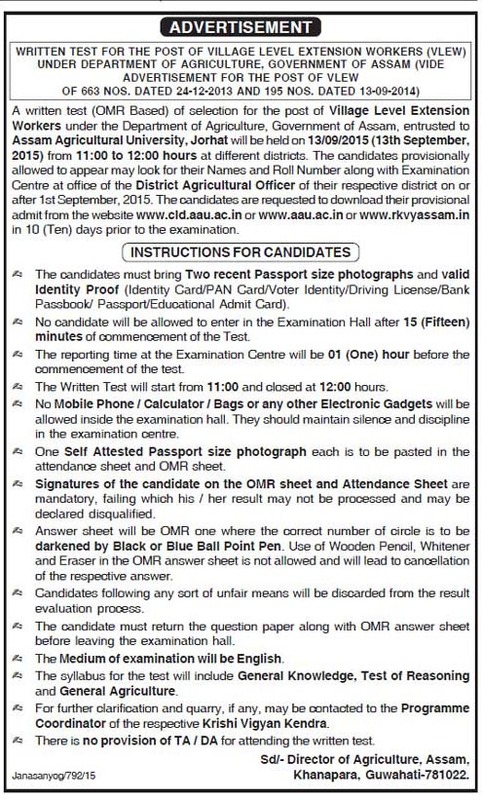 One Self Attested Passport size photographs each is to be pasted in the attendance sheet and OMR sheet. Signatures of the candidate on the OMR sheet and Attendance Sheet are mandatory, failing which his/ her result may not processed and may be declared disqualified. Answer sheet will be OMR one where the correct number of circle is to be darkened by Black or Blue Ball Point Pen. Use of Wooden Pencil, Whitener and Eraser is the OMR answer sheet is not allowed and will lead to cancellation of the respective answer. Candidates following any short of unfair means will be discarded from the result evaluation process. The candidate must return the question paper along with OMR answer sheet before leaving the examination hall. The Medium of examination will be English. The syllabus for the test will include General Knowledge, Test of Reasoning and General Agriculture. For further clarification and quarry, if any may contacted to the Programme Coordinator of the respective Krishi Vigyan Kendra. There is no provision of TA/DA for attending the written test. You can download the official advertisement from below for more information. Keywords: VLEW written test details, vlew admit card download, vlew call letter download, Village Level Extension Worker Written Exam details.